Who turned out in the Super Tuesday Democratic primaries and what motivated their votes? For all the answers, bookmark this page now or star it in the ABC News mobile app. Democrats will be voting today in Georgia, Oklahoma, Vermont, Virginia, Alabama, Tennessee, Massachusetts, Arkansas and Texas. There will also be Democratic caucuses today in Minnesota, Colorado and U.S. territory American Samoa. This latest update includes new analysis from Arkanas, Alabama, Massachusetts, Oklahoma and Tennessee and is based on preliminary exit poll results. Some conclusions could change after new data come in later tonight. The ABC News Analysis Desk will be updating this page all night with live analysis of the Super Tuesday exit polls. Now here's a summary of where we seeing in the Democratic contests across states, grouped by key themes. Race: While not reaching their levels in South Carolina a few days ago, black voters in make up half the electorate in Georgia and Alabama, dropping to roughly a quarter in Virginia, Arkansas and Tennessee and in the teens in Oklahoma and Texas. Hispanic voters are prominent only in Texas, where they account for three in 10 voters in preliminary results. In Vermont and Massachusetts, by contrast, whites account for nearly all voters. Race relations: More primary voters in most of today’s Southern states think race relations have gotten worse (between four in 10 to half) in the last few years than say they’re better (a third to four in 10). And more voters generally say they trust Clinton rather than Sanders to handle the problem (seven in 10 to eight in 10 vs. half to three-quarters). Obama: With the exception of Vermont, more voters across today’s primaries want to see a continuation of Obama’s policies (four in 10 to seven in 10), than would like a more liberal agenda implemented. That’s been a benefit to Clinton so far this primary season. Establishment: In sharp contrast to their counterparts voting in the GOP primaries today, Democratic primary voters overwhelmingly want the next president to be someone with political experience rather than someone from outside the political establishment (at least seven in 10, even in Vermont). Honesty: Clinton continues to have some challenges in views of her honesty. In five states today (MA, OK, TN, TX and CT) more voters say Bernie Sanders is honest and trustworthy than say the same about her. Attributes: The top attribute in six of today’s nine states with exit polls is experience. And about half name experience or electability as their most important trait in every state (save Vermont, where about three quarters say honesty or empathy was most important). Ideology: Similar to the GOP side, Democratic primary voters are more ideologically homogenous than in the past. Between roughly half and seven in 10 in preliminary results are liberals, including about two in 10 to a third who say they’re “very” liberal. That’s up pretty much across the board from 2008 and similar to what we’ve seen in the first four contests this year. Ideological fit: Southern state voters see a better ideological fit with Clinton than with Sanders. Six in 10 to seven in 10 say Clinton’s positions on the issues are about right. In contrast, about four in 10 to six in 10 think Sanders’ positions are about right, vs. a quarter to a third who say he’s too liberal. Sanders’ views generally fit much better with voters in Vermont and Massachusetts, as they did previously in New Hampshire. Satisfaction: Between three-quarters and eight in 10 voters today across the Southern states say they’d be satisfied with Clinton as the eventual nominee, vs. only half to seven in 10 for Sanders. 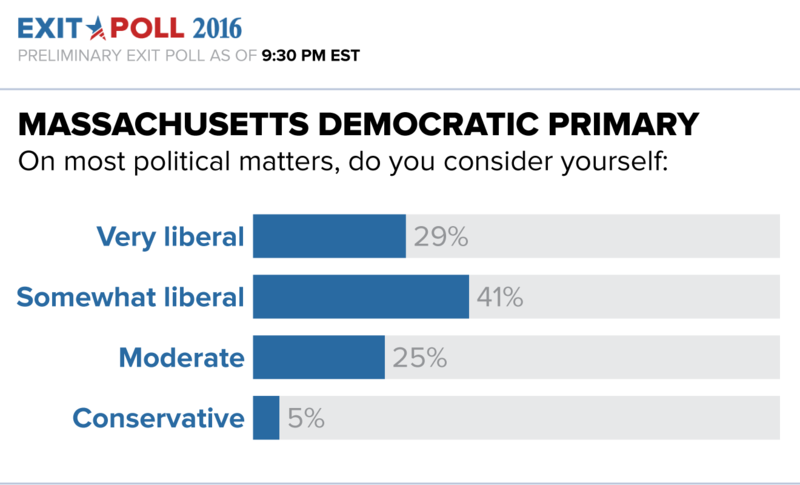 That’s the flipside of New Hampshire, where more voters said they’d be satisfied with Sanders as the nominee. Party: Other than Vermont and Massachusetts, far fewer independents are turning out in the Southern states today than did so in New Hampshire, the only state Bernie Sanders has won so far. They make up between two in 10 and a quarter of voters in the Southern states, vs. more than seven in 10 who are mainline Democrats, Clinton’s bread and butter to date. Age: First-time primary goers are far outnumbered by primary veterans across today’s contests. Relatedly, turnout among under 30s ranges between one in 10 to two in 10 in preliminary exit poll data, generally much lower than turnout among seniors. In the Democratic races, Massachusetts and Oklahoma are the most competitive. A few points on those races follow, with broad patterns on turnout and issues across states after that. These results are based on preliminary exit poll data that has not yet been weighted to actual vote totals. Such estimates can differ from final results, sometimes substantially. In Oklahoma, black voters account for only slightly more than one in 10 Democratic primary voters in preliminary exit poll results, far below their level among other Southern states voting today. Nearly three-quarters of Oklahoma Democratic primary voters were white, far higher than in the Southern primaries today, and they backed Sanders over Clinton by a double-digit margin. 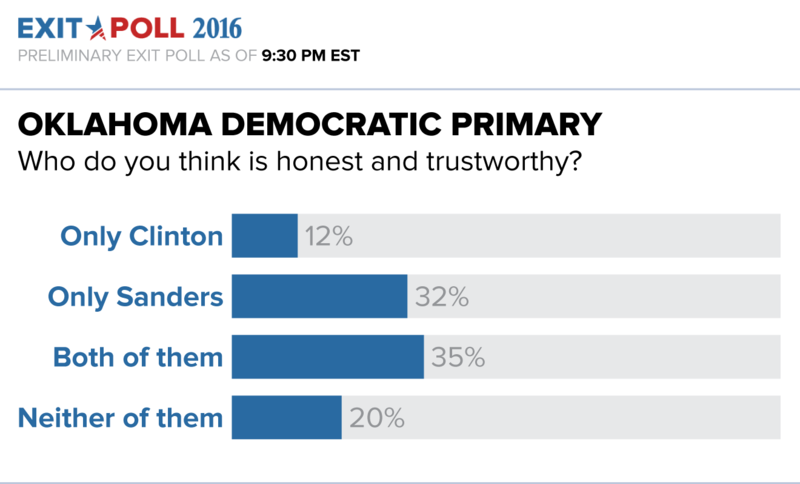 More voters saw Sanders as honest and trustworthy than said the same about Clinton (seven in 10 vs. half). Three in 10 said honesty and trustworthiness was most important in selecting their candidate, and more than three-quarters of them voted for Sanders. While nearly eight in 10 wanted a candidate with political experience, Clinton’s lead was much narrower among this group than in most other states (save Vermont). Sanders won more than three-quarters of those looking for a political outsider. Only four in 10 voters want the next president to continue Barack Obama’s policies, fewer than in all other states today save Vermont. A third wanted to change to more liberal policies. A quarter of voters are independent, a new high for the state, and two-thirds backed Sanders. Clinton had the advantage among mainline Democrats, but more narrowly. Unlike most of the Democratic primaries tonight, nonwhite voters accounted for just more than one in 10 Democratic primary voters in Massachusetts. Clinton beat Sanders among nonwhites, with nearly six in 10 support, but the race was much closer among the 86 percent of voters who are white. A record seven in 10 Massachusetts Democratic primary voters identified themselves as liberals, including three in 10 “very” liberal, a boost for Sanders. Mainline Democrats made up 65 percent of voters and Clinton has a healthy lead in this group, but Sanders had an even wider advantage among independent voters. Sanders was backed by about nine in 10 voters focused on honesty, while Clinton won about by the same margin among those focused on experience – and voters split on which is most important. A bit fewer than half (45 percent) said they want to continue Obama's policies, and they backed Clinton by more than 2-1. Sanders led among those who want a change in course. Only three-quarters want the next president to be an insider, lower than in most of today’s other states. More voters here think Bernie Sanders is honest and trustworthy than say the same about Hillary Clinton (more than eight in 10 vs. just more than half). 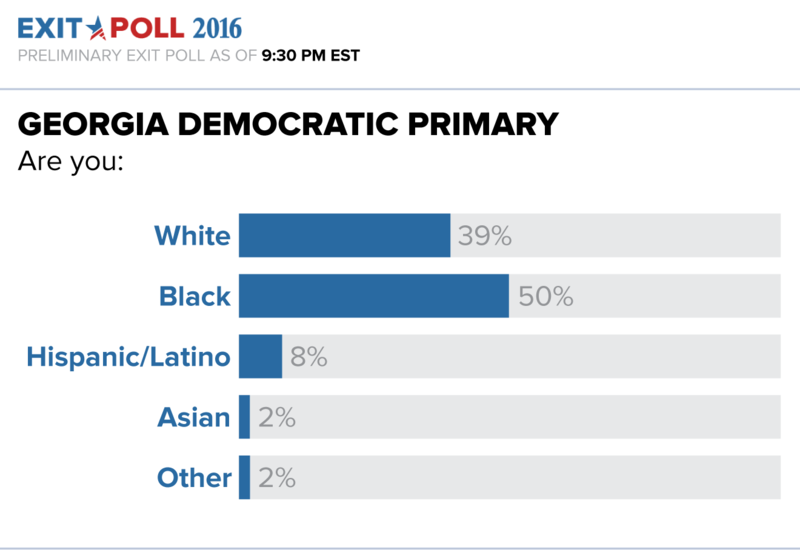 Nearly half of Georgia Democratic primary voters are black, and Clinton took home more than eight in 10 of their votes. As elsewhere, liberals are turning out in record numbers - 56 percent of voters, compared with 47 percent in 2008. That said, more than half of liberals, including strong liberals, backed Clinton over Sanders in preliminary exit poll results. 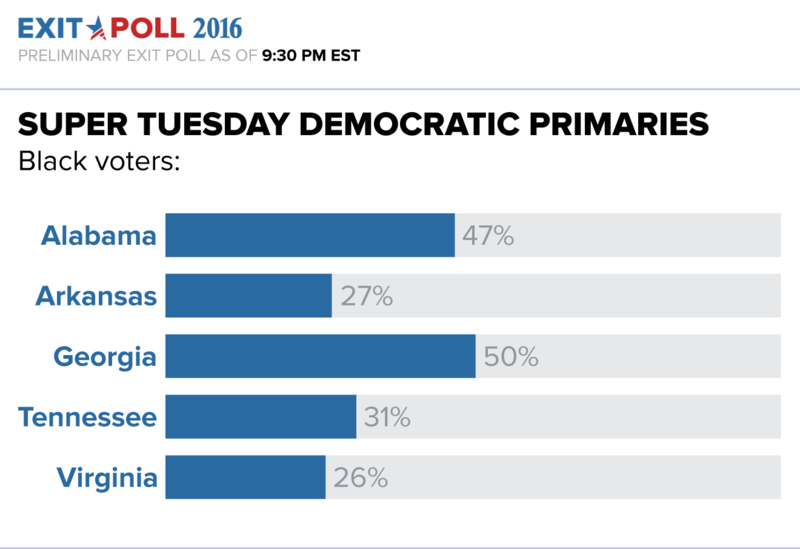 Clinton won women by more than 2-1 – and they made make up six in 10 voters in Georgia today. Sanders won a whopping nine in 10 voters under age 45. Four in 10 voters were independents, highest of any state voting today, similar to New Hampshire – and Sanders won more than nine in 10 of them. Three-quarters said honesty or empathy was their number one candidate trait, much higher than in other states, and nearly all of them sided with Sanders. Three-quarters were liberals, including a third very liberal, both new highs for the state. Nearly 9 in 10 liberals went to Sanders. But he won eight in 10 moderates in his home state, as well. Clinton was boosted in Virginia by strong support from women and the vast majority of voters who preferred experience in politics over an outsider. Over eight in 10 voters said they preferred someone with political experience rather than an outsider, and Clinton won in seven in 10 of them. More also said experience was their top candidate trait over anything else (nearly four in 10), with nearly all of them voting for her. She led by more than 2-1 among women, who made up a majority of today’s voters in Virginia. Her lead was much larger among nonwhite women, but she still carried six in 10 white women. One of Clinton’s best groups was seniors, who made up about a quarter of voters today, up 10 points compared with 2008. She won more than eight in 10 of their votes. Black voters account for three in 10 Democratic primary voters in Tennessee today and Clinton’s won more than eight in 10 of their votes. Clinton also won nearly two-thirds of women, a majority of today's voters. Sanders won 6 in 10 independents, though they only made up about a quarter of the electorate. Clinton won more comfortably among mainline Democrats. Two-thirds of Tennessee voters said Clinton’s views on the issues are about right, vs. only half who said so about Sanders’ views, with nearly a third calling him too liberal. A majority wanted to continue Barack Obama’s policies, something Clinton’s hitched her campaign to, and she won more than eight in 10 in this group. Nearly 4 in 10 were at least satisfied with how the federal government works; three-quarters of them went for Clinton. Nearly six in 10 said the economy or healthcare was their biggest issue; Clinton led with nearly two-thirds of these voters. Sanders only split with Clinton on income inequality, an issue he won by wide margins in Iowa, New Hampshire and Nevada. Clinton also won nine in 10 voters who wanted experience, the most important attribute overall. Sanders won the approximately half who cared most about honesty or empathy, though by much lower margins than in Iowa, New Hampshire and Nevada. A big gender gap continued here as in most other states in the Democratic primaries - women made up the majority of voters and Clinton won nearly three-quarters of their votes. Blacks accounted for more than a quarter of Democratic primary voters in Arkansas, a new high; Clinton took in nearly nine in 10 of their votes. Regardless of their race, more voters said they trust Clinton on the issue of race relations than Sanders, seven in 10 vs. just more than half. Clinton won eight in 10 voters age 45 and older, similar to many other Southern states tonight, though much higher than tonight's or previous Northern/Midwestern states and Nevada. Just more than half called themselves liberals, a new high for the state, including two in 10 “very” liberal. Clinton won six in 10 liberals , as well as seven in 10 moderates. Despite concerns after Nevada, Clinton performed strongly among the three in 10 Hispanic voters in Texas, winning more than six in 10 of their votes. It was a much closer contest among whites. Clinton also won women 2-1, similar to her results among women in other Super Tuesday states. Here, as elsewhere, they made up a majority of Democratic voters. Experience was the main priority for slightly more than three in ten voters, and they overwhelmingly backed Clinton. Similarly, more than eight in 10 said preferred a candidate with political experience over an outsider, and seven in 10 of them chose Clinton.